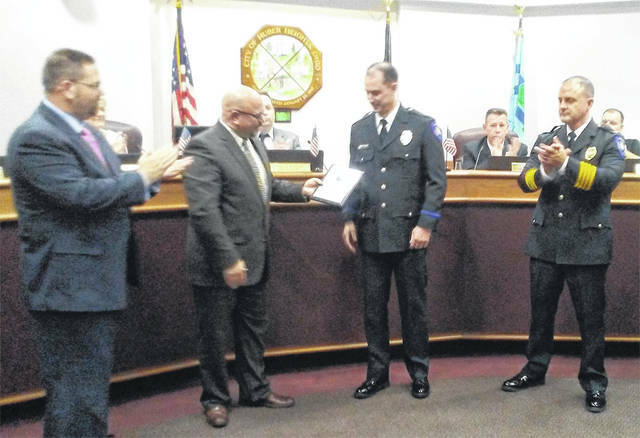 City Manager Rob Schommer presents police officer Scott Short with employee of the third quarter award while Mayor Jeff Gore and Police Chief Mark Lightner look on. HUBER HEIGHTS — Development – now and later – was the main topic at Wednesday night’s Huber Heights City Council meeting. The proposal for the Parkview development at the corner of Brandt Pike and Schull Road was the subject of a public meeting and later a vote by council. Metropolitan Holdings of Columbus is planning a 310-unit multi-family housing development on the site. The company was asking city council to rezone the area from planned commercial to planned mixed use so work can start on the project. The rezoning had been recommended by the city planning commission. The development would take place on 16 ½ acres and represents a $26 million investment by the developers. Todd Foley pf Pod Design was on hand with representatives of Metropolitan to explain the plan to council. The development would have a single entrance on Brandt Pike with a second entrance off Schull Road for use by emergency vehicles only. Foley said the proposal has been revised from an original plan that was submitted close to a year ago and now has fewer units than originally proposed. It also now has a wider greenspace along Schull Road than in the first plan. Two city residents raised questions about the proposal at the public hearing. Toni Webb questioned what would happen with increased traffic on Brandt Pike, particularly with difficulty of turning left out of the development onto Brant Pike. Assistant City Manager Scott Falkowksi explained that the traffic from Parkview would be less than the amount of traffic that would have been generated from the previous commercial plans for the site. He said a traffic study had been done when Brandt Pike was widened, which took place “around 2005.” He also said having the entrance for emergency vehicles only on Schull Road instead of making it a second entrance for general use was a “safer option” for the area. Edward Zapatony, who lives on Schull Road, questioned the location of the development, impact on local drainage and traffic. Zapatony said there wasn’t enough time given to truly discuss the plan and said there was no “give and take” between residents who opposed it and city officials. Falkowski assured Zapatony that city building codes require that runoff not be increased by developments, so there would not be additional drainage problems. Councilman Richard Shaw questioned the single entrance on Brandt Pike. He said he would like to see the old traffic study and suggested a second entrance for public use on Schull Road might be a good idea. He also wondered about the lack of a playground in the development. Still, he said he supported the proposal and said it would be a great asset to Huber Heights. City Manager Rob Schommer asked that council waive the second reading of the ordinance making the zoning change so work could move forward on the plan. Shaw voted against waiving the second reading, but then joined other council members in unanimously voting for the zoning change. Later in the meeting, a plan to create a Transformative Economic Fund for economic development was passed by council. Money from the sale of city property would go into the fund to be used for economic development. Councilman Seth Morgan said he sees the fund as a step toward a stronger city economic development program in the future. “From my perspective, if we can fund this fund, and I think we all know we can, I think it’s going to put us in a very powerful position to put some additional funding behind the talk that has been going on in this community for many years,” he said. Council voted 7-0 to establish the fund.